Author: Locke, Edwin A.; Latham, Gary P.
This is the finest scientific book on goal setting that I have read to date. Its subject is the connection between setting challenging objectives and goal attainment. Of enormous significance in this context is the goal setting theory developed by the work’s editors, Edwin A. Locke (University of Maryland) and Gary P. Latham (University of Toronto). The goal setting theory is, in a nutshell, a motivation theory that is supposed to explain “what causes some people to perform better on work-related tasks than others” (p. 3). There is a linear relationship between the degree of goal difficulty and performance.” Locke found that the performance of people with the highest goals exceeded that of people with the easiest goals by more than 250 percent (p. 5). 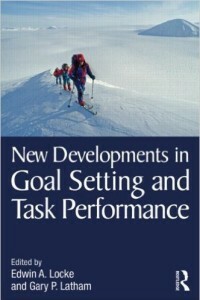 Specific, difficult goals lead to higher performance than no goals as well as vague, abstract goals such as ‘do your best’.” 51 out of 53 studies conducted up to 1990 demonstrated “the benefit of setting a specific, high goal” (p. 5). The basis underlying this insight was highly plausible even in 1990 – the goal setting theory was developed inductively through studies involving 40,000 participants in eight countries, both through field studies and experiments (p. 11). High and specific goals are so important because they focus the individual’s attention on “goal-relevant activities” and because they enhance the intensity and temporal duration of the effort the individual will make to attain it. People with high specific goals work harder and longer to accomplish them than those who work without such goals (p. 6). In their anthology of 37 essays, Locke and Latham document the progress that science has made on the subject in the years between 1990 and 2010. During this time period, another 600 studies were done that confirmed the key assumptions of the goal setting theory and showed its usefulness in a larger number of domains (p. xi). In their chapter on “stretch goals,” Steve Kerr and Douglas LePelley discuss the question how difficult the goals should be in order to achieve optimal results. “Compared to easy goals, difficult goals are far more likely to generate sustained enthusiasm and higher levels of performance. However, this finding comes with an important caveat, namely, that the goals, though difficult, must be seen to be achievable by those who are supposed to attain them” (p. 21). On the one hand, they argue that high, meaning unattainable goals could have the opposite effect because they result in frustrating experiences if people repeatedly fall short of the mark. On the other hand, the example of General Electric where Jack Welch applied the strategy of “stretch goals” goes to show that it can be quite stimulating to set “impossible” goals. The authors cite Welch who concluded “we have found that by reaching for what appears to be impossible, we often actually do the impossible; and even when we don’t quite make it, we inevitably wind up doing much better than we would have done” (p. 29). Albert Bandura is the founder of the “self-efficacy” theory, and contributed a chapter on the subject to the book. He points to the connection between self-efficacy and the magnitude of the goal that people set for themselves: “Those who were dissatisfied with the substandard performance but judged themselves efficacious to meet the challenge redoubled their efforts… Those who judged themselves inefficacious to meet the challenging goal and couldn’t care less about their mediocre performance slackened their effort and just coasted along apathetically” (pp. 149-50). “People who are beset with self-doubts about their capabilities do not go around setting challenging goals for themselves and sticking for long in the face of difficulties to the goals adopted. People’s beliefs in their capabilities influence the level of goals they set for themselves. The stronger the self-efficacy, the higher the goals people set for themselves” (p. 151). An approach labelled “mental contrasting” by Gabriele Oettingen, Marion Wittchen and Peter M. Gollwitzer has proven particularly effective in attaining lofty goals. “Mental contrasting of a desired future with obstacles of present reality” is an effective self-regulation strategy for attaining goals, as a number of psychological experiments is said to have shown (p. 523). The authors cite evidence proving that “mentally contrasting a desired future with the reality that impedes its realization will create selective, that is, expectancy-dependent goal commitments with subsequent goal striving and goal attainment” (p. 524). J. Robert Baum, one of the leading representatives of entrepreneurship research in the Unites States contributed a chapter on “goals and entrepreneurship” to the volume. The goal setting theory is particularly well suited for researching entrepreneurship “because it covers self-set goals and involves explicit, consciously chosen targets that are usually focused on performance” (p. 462). Early-stage financiers confirm that most successful entrepreneurs “begin with goals that are beyond normal conceptions of the possible” (p. 463). Baum cites numerous surveys which show that goal-setting theory prediction that challenging goals are associable with superior performance, was supported by empirical evidence in entrepreneurship research (p. 463). “Multiple entrepreneurship studies support the view that entrepreneurs who set their own goals are motivated to attain higher performance than if they had no goals” (p. 464). Entrepreneurs, according to Baum, are visionaries who have the ability “to see beyond the immediate moment, to see past what is working now, to see what will work in future” (p. 468). He cautions, however, that the business vision should not be confused with the official “vision statements” whose purpose is rather to inspire staff or to be communicated to outsiders. “The full vision, however, is inside the entrepreneur’s head and is much more detailed than any one statement or slogan” (p. 468). I admit that I was unaware of the American goal-setting theory when writing my own book “Dare to be Different and Grow Rich,” published in 2011. However, when reading this anthology, I found everything confirmed that I had developed into a hypothesis in my own right after analysing around 50 biographies of successful individuals: The questions of how big (and how specific) the goals are that people set for themselves, and how seriously they strive to attain them, are key factors when explaining success in any walk of life. R.Z.